Background: An in-frame fusion protein between echinoderm microtubule-associated protein-like 4 (EML4) and anaplastic large cell kinase (ALK) genes is seen in some non-small cell lung cancer (NSCLC). EML4-ALK demonstrates constitutive kinase activity. These ALK-positive lung carcinomas have been shown to respond to ALK kinase inhibitors. 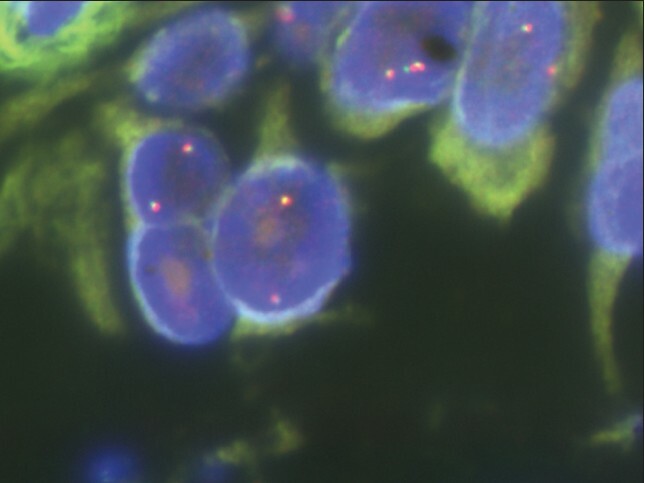 ALK gene rearrangement is commonly detected using fluorescent in situ hybridization (FISH). Aims: To study the pathological features of ALK positive and negative NSCLC and evaluate the causes of uninterpretable FISH results. Materials and Methods: This is a retrospective, observational study. The molecular pathology records of patients on whom test for ALK had been performed in a period of 1 year (February 2012 to February 2013) were accessioned. A total 224 cases were identified. Histological features were reviewed. The in situ hybridization was performed using Vysis ALK Dual Color Break Apart Rearrangement Probe (Abbott Molecular Inc.). Signal interpretation under the fluorescent microscope was performed in accordance with College of American Pathologists guidelines. Results: Five patients showed ALK gene rearrangement, 182 were negative and 37 cases were uninterpretable. Five patients with ALK gene rearrangement had a mean age of 48 years and the male to female ratio was 2:3. In the ALK negative cases, the mean age was 54 years and male to female ratio was 3.2:1. Histologically, amongst the rearranged cases, three showed solid pattern, one showed acinar and one showed acinar with signet ring cells on histology. Conclusion: The percentage of ALK gene rearrangement was 2.7% (excluding the uninterpretable cases). These ALK positive patients were relatively younger than ALK negative patients. Solid pattern on histology was associated with ALK positivity. In a quarter of the uninterpretable results, the material submitted was fixed and processed outside. Background: Epidermal growth factor receptor (EGFR) mutation plays a vital role in the prognosis of patients with lung cancer. However, there is a dearth of studies on EGFR mutation in Indian population. In this retrospective study conducted at a network of tertiary cancer care centers across India, we evaluated the proportion of EGFR mutation in patients with non-small-cell lung carcinomas (NSCLC). Materials and Methods: A total of 1036 cases of non-small lung cancer were assessed for EGFR mutation status using Scorpion amplified refractory mutation system real time polymerase chain reaction method from fine needle aspiration cytology core biopsy, pleural fluid and cell blocks. For a few cases, macro dissection of tumor from H and E slides was also performed for EGFR analysis. EGFR Status was assessed for the most commonly known driver mutations in Exons 18, 19, 20 and 21, which contributes to a total of 29 somatic mutations including the resistance mutation T790M. Results: Around 39% of the cohort was female and 61% were male. Mutation was positive in 40.3% and negative (wild type) in 59.7%. There was 1.8% mutation in exon 18, 24.6% in exon 19, 1.6% in exon 20 and 12.8% in exon 21. 38.2% had a mutation in a single site and 1.1% had a mutation in two sites. Overall mutation was significant in females (50.5% vs. 33.9%) compared with males (χ2 = 28.3, P < 0.001). Mutation was significant in exon 21 (16.8% vs. 10.3%, χ2 = 9.44, P = 0.002) and exon 19 (30.7% vs. 20.7%, χ2 = 13.2, P < 0.001) in females compared with males. Conclusion: EGFR is expressed differentially/mutated in patients with NSCLC. Further studies to unravel the predictors for acquired genetic alterations of EGFR are needed. 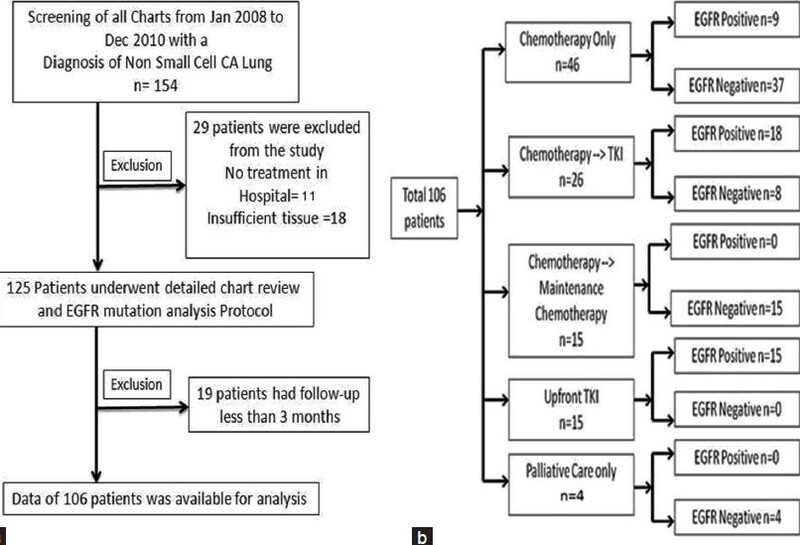 Introduction: We performed retrospective analysis of 106 patients with lung cancer for which formalin-fixed paraffin-embedded tissues was available. Their epidermal growth factor receptor (EGFR) mutation status and treatment outcomes are described. Materials and Methods: All patients with confirmed non - small cell lung cancer (NSCLC) during Jan 2008 to Dec 2010 were included. EGFR sequencing was performed with ABI PRISM 310 genetic analyzer. Results: Forty-two (39.6%) patients had mutation in one of the four exons characterized. Patients whose EGFR mutational status was not available at presentation before the start of treatment were started on chemotherapy, n = 46 (43.39%). If EGFR mutational analysis was available and mutations were present, the patients were started on either upfront tyrosine kinase inhibitor (TKI), n = 15 (14.15%) or if on chemotherapy arm were allowed to finish six cycles and then start with maintenance TKIs, n = 26 (24.52%). The median progression free survival for patients with and without mutations was 11 months (95% CI,7-14) and 9 months (95% CI,7-10) respectively. A median PFS of 14 months (95%CI, 12-16) was seen in the mutation-positive group that received both chemotherapy followed by switch maintenance with TKIs versus 8 months (95%CI, 7-8 months) in the group that received only TKI. Conclusion: The prevalence of EGFR mutations in this population of NSCLC patients was 39.6% with exon 19 mutation being the most common. 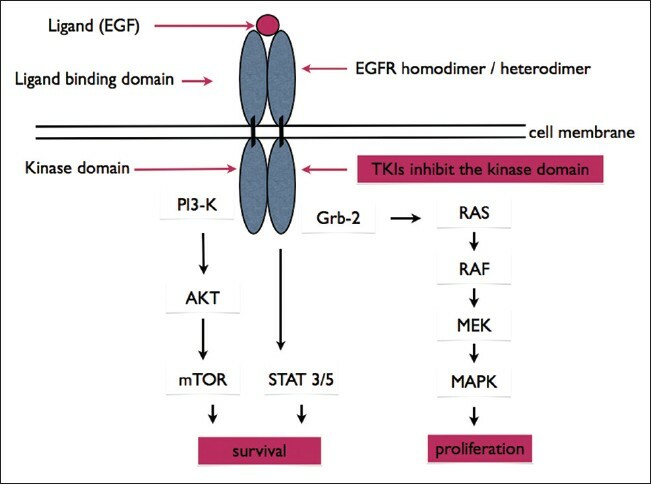 The observed benefit of addition of chemotherapy over TKI in EGFR mutation-positive group raises the question, can we offer the therapy of chemotherapy-TKI combination to EGFR mutation-positive lung cancer patients as shown in the present study. Background: Lung cancer is the leading cause of cancer related mortality world-wide and amongst males in India. The discovery of tyrosine kinase inhibitors holds a ray of hope for a subset of lung cancer patients, which have activating epidermal growth factor receptor (EGFR) mutations. Much of the preliminary data on frequency of EGFR mutations emanated from Western studies, which reported EGFR mutation rates of 10-15%. However, studies from Asian countries report a much higher frequency of EGFR mutations, not only in the male population, but also in females. 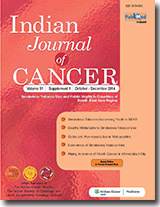 AIM: The object of this study was to share the author's experience of EGFR mutation testing in 402 lung cancer patients as no large-scale study addressing the issue has been published from India. Materials and Methods: Formalin fixed paraffin embedded tissues were analyzed for EGFR exon 19 deletions and exon 21 point mutation by length analysis of fluorescently labeled polymerase chain reaction products on Applied Biosystems Inc. 310 genetic analyzer. Results: Out of 402 samples, 35 samples could not be analyzed because of poor deoxyribonucleic acid material. Thus of the remaining 367 cases analyzed, EGFR mutations were found in 118 patients (32%). Mutations were equally distributed between males (50%) and females (50%). 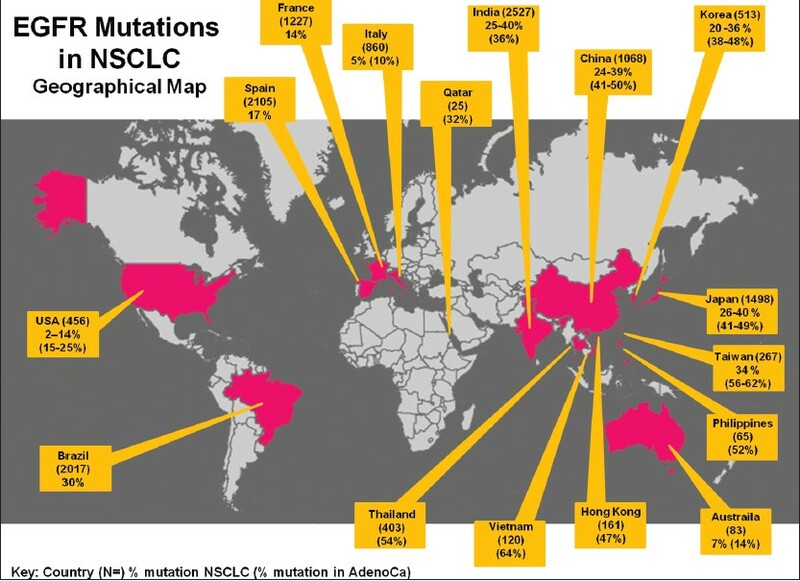 Majority of the mutations were seen in adenocarcinoma subtype (90%). 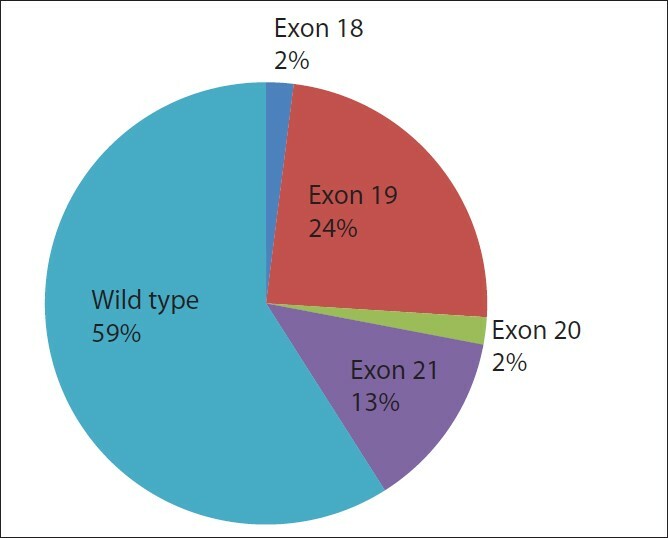 Exon 19 mutations accounted for 76% while exon 21 mutations accounted for 24% of the mutations. Summary: EGFR mutation frequency is higher in Indian population vis-à-vis Caucasian population, but lower than that reported in the East Asian population. A significantly higher number of males also harbor EGFR mutations. Background: The Medical Oncology Department at Tata Memorial Hospital, the single largest tertiary cancer care center in Asia, receives in-house registered and referral patient samples from all parts of the country. Our recent studies establish 23% EGFR mutation frequency among Indian population. Here, we extend our study and report further analysis of distribution of different types of EGFR mutations in 1018 non small cell lung cancer patient, and its co-relation with clinical parameters and geographical variations across the country. Material and Methods: This study is a retrospective analysis on all the patients who were referred for EFGR testing as a routine service over a 1.5 year period. This was part of standard care. EGFR kinase domain mutations in exon 18-21 were probed by TaqMan probe-based assays in 1018 NSCLC patients. Results and Discussion: While EGFR exon 19 mutations, the most frequent EGFR mutation, were found be higher among non smokers females, we find surprisingly higher incidence of exon 21 mutations among EGFR mutation positive male smokers of Indian ethnicity. Furthermore, as Indian population is known to be composed of a gradient admixture of Ancestral North Indian (with genetic influence from Middle Easterners, Central Asians, and Europeans harboring variant EGFR mutation frequency) and Ancestral South Indians, as a paradox our study indicates comparable EGFR mutation frequency across different geographical locations within India Conclusion: Geographically there is uniform distribution in the EGFR mutation frequency within India. Further more, while exon 19 mutations are predominant among non smokers, higher incidence of exon 21 mutations exists among EGFR mutation positive male smokers of Indian ethnicity. Background: Metronomic chemotherapy (MCT) with cyclophosphamide (Cy) and celecoxib (Cel) has therapeutic efficacy and low toxicity profile in advanced breast cancer patients (ABCP), but no reliable biomarkers of response have been found yet that allow patient selection for treatment. AIM: To investigate the potential role as biomarkers of pro- and antiangiogenic parameters and evaluate their response in ABCP receiving metronomic Cy 50 mg p.o./day + Cel 400 mg p.o./day. 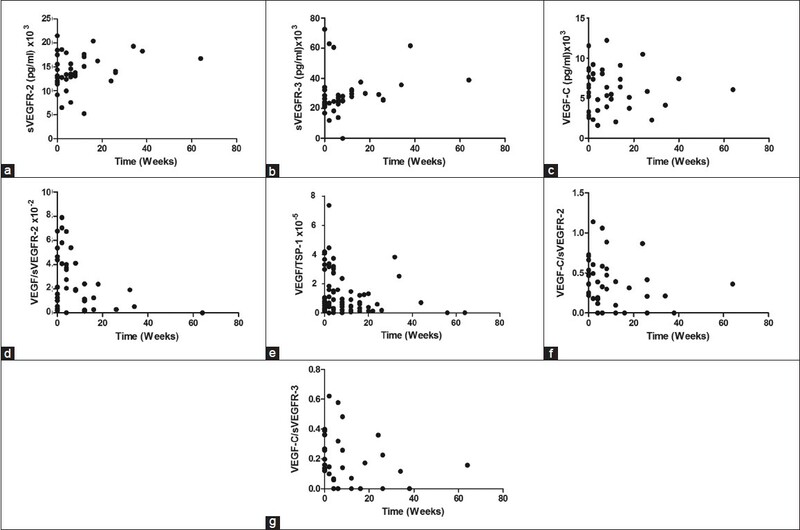 Materials and Methods: Serum levels of vascular endothelial growth factor-C (VEGF-C), soluble VEGF receptors 2 and 3 (sVEGFR-2, sVEGFR-3), were measured at different time points in 13/15 patients included in a phase II trial of MCT with Cy+Cel. Results: Serum levels of sVEGFR-2 and sVEGFR-3 increased significantly during treatment (P = 0.0392; P = 0.0066, respectively). VEGF-C showed no significant modifications. Previous determinations of VEGF and TSP-1 in the same patients were utilized. VEGF/sVEGFR-2, VEGF/TSP-1, and VEGF-C/sVEGFR-3 ratios decreased significantly along the treatment (P = 0.0092; P = 0.0072; P = 0.0141, respectively). Nonsignificant variations were observed for VEGF-C/sVEGFR-2 ratio. Baseline values of VEGF/sVEGFR-2 and VEGF/TSP-1 ratios were associated with time to progression (TTP) (P = 0.0407; P = 0.0394, respectively) meanwhile baseline VEGF was marginally significant (P = 0.0716). Patients with values lower than the 50 th percentile for both ratios showed longer TTP. Conclusions: We have identified the baseline VEGF/sVEGFR-2 and VEGF/TSP-1 ratios as potential biomarkers of response in ABCP treated metronomically with Cy+Cel. This finding warrants its confirmation in a higher number of patients. Context: There are limited effective therapeutic options in the relapsed setting for non-small cell lung cancer (NSCLC) or in the first line for platinum-ineligible patients. Aim: To evaluate the safety and efficacy of a metronomic schedule of paclitaxel administered weekly in relapsed refractory NSCLC or upfront in patients not eligible for platinum-based chemotherapy. Settings and Design: Retrospective analysis of a prospectively collected database from the medical oncology department at Tata Memorial Hospital in Mumbai, India. Materials and Methods: Patients with recurrent and treatment-naïve platinum-ineligible advanced NSCLC were treated with weekly paclitaxel at 80 mg/m 2 with palliative intent. Restaging scans were obtained every two months. Chemotherapy was continued until progressive disease, intolerable side effects, or decision of the patient. Statistical Analysis Used: SPSS version 16 was used for analysis. Simple percentages were used for descriptive statistics. Progression-free survival (PFS) was calculated from date of start of paclitaxel till the date of progression, change of therapy due to any reason, or death due to any cause. Overall survival (OS) was calculated from date of start of paclitaxel to death. 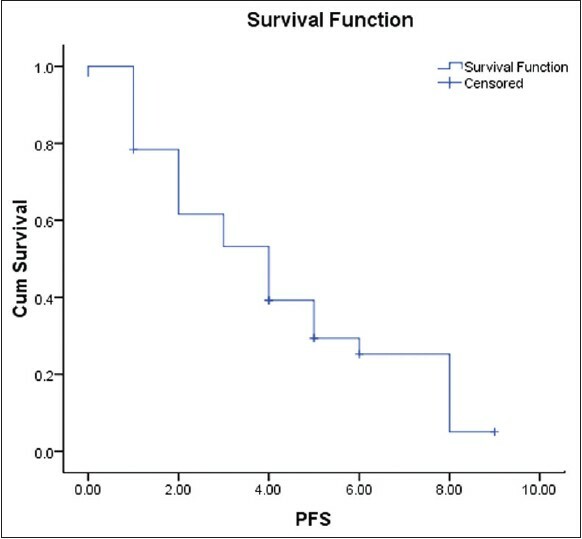 The Kaplan Meier method was used for estimation of survival. Results: There were 37 patients over eight months. The median age was 59 years, with a male-to-female ratio of 5:1. Two patients received paclitaxel in the first line, 18 patients in second line, nine in third line, five in fourth line, and three were in fifth line. 73% patients had received prior platinum and 48.6% patients had Eastern Cooperative Oncology Group performance status (ECOG PS) >2. The median number of weekly cycles delivered was 14. The response rate was 35% [complete remission (CR): 2.7%, partial remission (PR): 32.4%, stable disease (SD): 32.4%, progressive disease (PD): 27%], the median PFS was four months, and the estimated median OS was seven months. Chemotherapy was well tolerated. The most frequent grade 3 toxicities included anemia: 8%, neutropenia: 5.4%, and sensory neuropathy: 8%. There were no grade 4 toxicities and no episodes of febrile neutropenia. Conclusions: Weekly low-dose continuous metronomic-type scheduling of paclitaxel is safe and effective for relapsed refractory NSCLC and in the first line in platinum-ineligible patients. Context: Advanced esophageal cancer is aggressive with an expected median survival of 6-7 months. Combination chemotherapy regimens provide effective palliation, but result in substantial toxicity. Materials and Methods: Retrospective analysis of prospectively collected data of patients with advanced esophageal cancer, not amenable to definitive intent therapy who were treated with intravenous weekly paclitaxel. Results: Between October 2010 and August 2011, 51 patients were included. Median age was 56 years, with a male: female ratio of 2.9:1. 29% were mid esophageal and 55% were lower third and gastroesophageal junction tumors. 65% of the tumors had squamous histology. Performance status was > 2 in 45%. 61% patients had received prior therapy, either definitive or palliative. 51% patients were platinum-pre-treated and 29% had received prior 3 weekly paclitaxel. 76% patients had distant metastases. Median number of cycles of weekly paclitaxel delivered was 11. 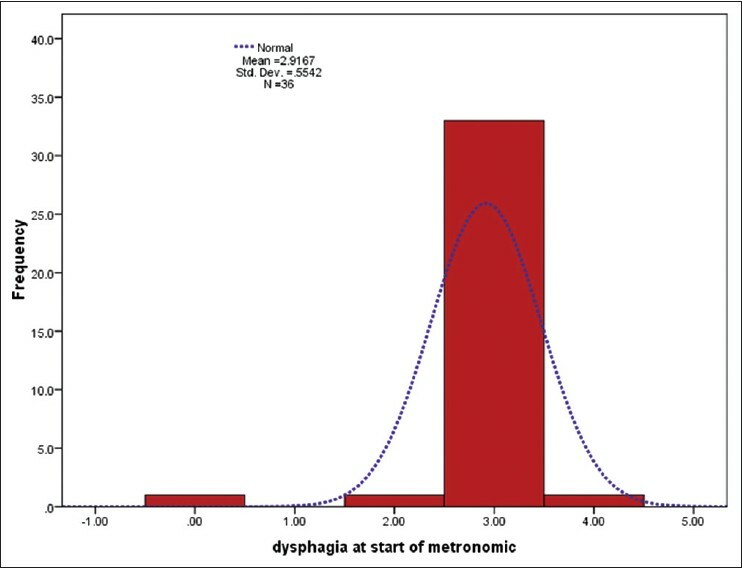 71% of patients had improvement in dysphagia, with a median time to symptom improvement of 9 days. In 72% patients, the feeding nasogastric tube could be removed. Overall response rate was 49% (complete remission: 4%, partial remission: 45%, stable disease: 13%). Median progression free survival was 4.7 months (confidence interval [95% CI: 3.7-5.7 months]) and median overall survival was 7.5 months (95% CI: 3.1-11.8 months). Histopathology, performance status and pre-treatment albumin significantly affected survival. The most common grade 3/4 toxicities included hyponatremia (14%), fatigue (16%), diarrhea (12%), anemia (31%), neutropenia (10%) and febrile neutropenia (4%). Conclusions: Metronomic weekly paclitaxel chemotherapy may provide palliative benefit in advanced unresectable metastatic esophageal cancer with minimal toxicity. Context: Head and neck cancers in developing countries present with advanced disease, compounded by poor access to tertiary care centers. Aim: We evaluated oral metronomic scheduling of anticancer therapy (MSAT) in advanced operable oral cancers, in conjunction with standard therapy. Settings and Design: This was a retrospective matched-pair analysis carried out in a tertiary referral cancer center. 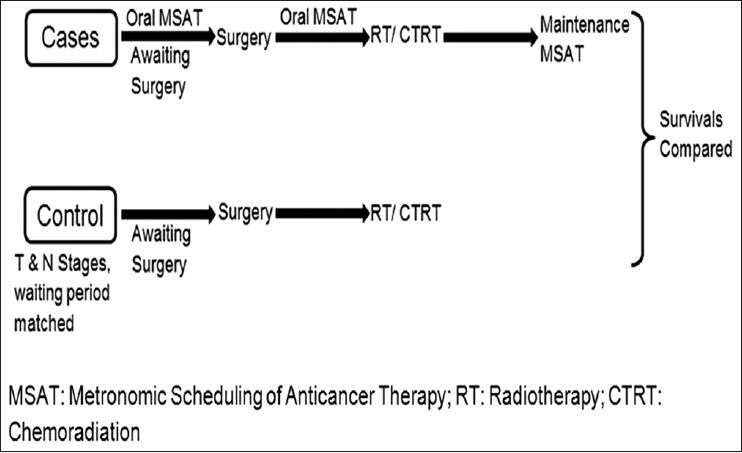 Materials and Methods: Advanced operable oral cancer patients having a waiting period for surgery > 3 weeks were administered MSAT. Patients then underwent standard therapy (surgery +/- adjuvant radiation/chemoradiation) as warranted by the disease, followed by MSAT maintenance therapy. Outcomes of the MSAT group were compared with stage-matched controls with similar waiting periods. Statistical Analysis: Survivals were found using the Kaplan-Meier method and compared between groups using the log rank test. Results: Response was seen in 75% of 32 patients. Two-year disease-free survivals (DFS) in MSAT and control groups were 86.5 and 71.6%, respectively. Two-year DFS in MSAT group who received at least three months of MSAT was 94.6% (P = 0.03). Conclusions: Oral MSAT is an economical, effective, and safe adjuvant therapy for oral cancers. It has the potential for preventing progression of the disease and improving DFS. Cytotoxic antiproliferative chemotherapeutic agents are the mainstay of treatment in cancers. Chemotherapy is usually administered every 2-3 weeks. Along with acute toxicity and long-term effects of cumulative doses, this strategy potentially allows regrowth of the tumor in the interval period and leads to the emergence of resistant populations of tumor cells. Moreover, even with intense chemotherapy, the outcome is stagnating for most of the tumors. There has been recent interest in the use of chemotherapy in fractionated doses which is far below the maximum tolerated dose. This is called metronomic scheduling of chemotherapy. Here, we review the biology and evidence for metronomic chemotherapy. Cholangiocarcinoma (CCa) is relatively resistant to chemotherapy as well as radiation therapy, and complete resection is the main curative therapy for these patients. The prognosis for patients with unresectable intrahepatic CCa (iCCa) is extremely poor. A 55-year-old woman presented at our hospital with abdominal pain. After evaluation, she was diagnosed to have multifocal iCCa. She did not opt for standard chemotherapy and therefore received oral metronomic therapy with a combination of celecoxib, etoposide, and cyclophosphamide for a total of 30 months. Presently, she is 57 months post diagnosis and 27 months post cessation of all treatment and continues to be in complete radiological remission. In the present report, we review the literature and discuss whether metronomic scheduling of biologic agents and anticancer drugs will be able to overcome chemoresistance and improve the outcome in cholangiocarcinoma. References for the review were identified through searches of Pubmed for the last 10 years as well as searches of the files of the authors themselves. The final list was generated on the basis of originality and relevance to this review. Acute myeloid leukemia (AML) in older adults differs biologically and clinically from that in younger patients and is characterized by adverse chromosomal abnormalities, stronger intrinsic resistance, and lower tolerance to chemotherapy. In patients over age 60 with AML, cure rates are under 10% despite intensive chemotherapy, and most of them die within a year of diagnosis. Over the last decade, metronomic chemotherapy has emerged as a potential strategy to control advanced/refractory cancer. Here, we report a case of a 68-year-old gentleman having AML with high-risk cytogenetic features, who achieved complete remission on our oral metronomic PrET (PrET: Prednisolone, etoposide, thioguanine) protocol on an outpatient basis. He was later treated with standard high-dose (HD) cytosine arabinoside (Ara-C) consolidation followed by maintenance with etoposide, thioguanine, and sodium valproate. Presently, the patient is nearly 35 months since diagnosis and 21 months off treatment. This case report and review highlights that the combination of oral low-intensity metronomic therapy, followed by standard HD consolidation therapy and metronomic maintenance therapy may be well tolerated by elderly patients especially with less proliferative, high (cytogenetic)-risk AML who are otherwise deemed to be unfit for intensive intravenous induction chemotherapy regimens. References for this review were identified through searches of Pubmed for recent publications on the subject as well as searches of the files of the authors themselves. The final list was generated on the basis of originality and relevance to this review.